The first fire broke out near the Be'eri Forest, another in Sa'ad Junction and a third in the Shokeda Forest. The fires are suspected to have been started by incendiary balloons flown from Gaza into Israel, and fire investigators are on the scene. Recent days saw a halt in incendiary balloon fires. "It was likely a balloon, as the fire broke out at Sa'ad Junction within seconds and at this point there isn't anything else apart from an incendiary balloon that can be pointed to as the cause of the fire, but we're still examining the matter," said one of the security forces personnel on the scene. The fires are getting more coverage in Arabic media than in Israeli media. There aren't as many as there were a month or two ago, when we would see 10 fires being set a day, but any single forest fire can be devastating. 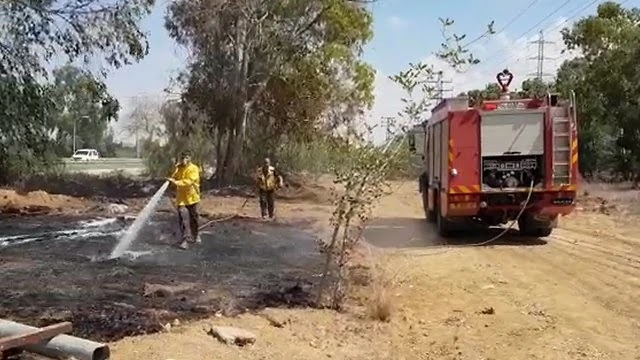 The JNF page says that as of a week ago, their firefighters had been involved in putting out some 1160 blazes since this new form of terrorism emerged.